"Our world as we know it is much simpler to put to an end than you might think. " Body Of Lies finds director Ridley Scott once again addressing heavy-duty international conflict on a large scale. That he has already done it so well with the likes of Black Hawk Down and Kingdom Of Heaven gives this 2008 outing the misfortune of needing desperately to measure up against the power of those films. And the fact that it fails to do so is then doubly (or triply?) frustrating, as what could have and should have been a more connected movie fails to gel. Body Of Lies is carried by a talented director who seems to have an innate sense of creating complex but malleable mainstream entertainment, and one that features Leonardo DiCaprio and Russell Crowe, two marquee names that also can often pull engaging performances out of nowhere. DiCaprio is Roger Ferris, a hardscrabble CIA operative working in Jordan in an attempt to unravel a deadly terrorist network. He's linked electronically stateside to his handler Ed Hoffman, played with a paunchy swagger by Russell Crowe, and for the first part of the film the two constantly bicker over ethics and directives, as DiCaprio's Ferris is pushed around like a chess piece as they hunt for a high level terrorist known as the "White Whale." Meanwhile, Crowe's Hoffman is in Virginia, carting his kids to soccer games while he orders deadly counterstrikes from the front seat of his mini-van. It's a dangerous game�rife with torture, explosions, shoot outs, and helicopters�as international politics and hidden agendas begin to intertwine in complicated ways. The film constantly bounds from location to location, moving from England to Iraq to Virginia to Jordan to Dubai to the Netherlands, and back again. Scott clearly has the skills to hold that all together into a somewhat cohesive package, dovetailing the narrative neatly so that the globe hopping bits do give the plot the proper heft of the hare-trigger international situation that the characters in the film seem to indicate it is. And some of the complex plot movements and allegiances�not rocket science, but content that does necessitate paying close attention�barrels forward, leading up to the more traditional spy elements of the film's second half. DiCaprio's Ferris�in between all the shooting and running and torture�gets to dabble in a forbidden romance with the lovely Golshifteh Farahani, and their budding relationship presents the film with a couple of solid "smaller" moments, though certainly ultimately very important to the story overall. But with a runtime over two hours, the romantic sidesteps almost cripple a film that already seems to be too heavy for its own good, one that saunters when it should be racing, and one that finally reaches its politically-charged conclusion that almost seems to come as an anti-climax. And if there were any other director's name on this one I could more readily discount it as an overblown mistake, a case of biting off more than could be chewed. But Scott seems comfortable in waters such as this, and even having William Monahan (The Departed, Kingdom Of Heaven) work the screenplay, Body Of Lies exists as a spy movie that seems clinically detached and unnecessarily meandering. Image Transfer Review: Body Of Lies is presented in its original 2.40:1 anamorphic widescreen aspect ratio, delivered via a 1080p VC-1 encode. The overall color palette tends to be relatively drab, a purposeful directorial intent that saturates the film in dark browns and an almost metallic blue. Transfer-wise it all looks very clean, with nicely defined edges and a fine level of detail on facial features, but it just never overdoes it. This one lacks the immediate dramatic pop evident on some other BD titles, but the absence of any sweeping evidence of noise reduction combined with the almost subtle revelatory level of textural details makes this a deceptively strong transfer. Perhaps not the be all/end all of the BD format, but a solid entry that does look quite good. Audio Transfer Review: The Dolby TrueHD 5.1 does the expected aural tricks during the occasional explosion or gunfire, providing a deep, full-bodied LFE-dominated presence. But where it really shines are what can only be referred to as the softer moments, those instances where characters are in relatively normal surroundings. It's here that the surround channels generate an understated sense of being, so that as Leonardo DiCaprio wanders through a crowded street market there's a real-life feel to background voices and ambient sound. Dialogue and voices, whether speaking English or not, are presented cleanly and clearly. Dolby Digital 5.1 dubs are included in French, Spanish, and Portuguese. Extras Review: This two-disc set is packaged with a slipcover, if that's important to you; the second disc contains the downloadable digital copy of the film. The extras are anchored by a commentary from director Ridley Scott, screenwriter William Monahan, and author David Ignatius. It is one of those cobbled-together tracks, where the participants were recorded separately, so the flow of information and the way it's presented varies, depending on the speaker. The recurring idea of "capturing the essence" of Ignatius' book is prevalent, and the author does a wonderful job relating his real-life experiences and how they are portrayed in the film. Scott and Monahan stick closer to the film itself, offering plot analysis and explanation, as well as the usual production-related anecdotes. A series of nine brief 6- to 8-minute behind-the-scenes bits called Actionable Intelligence: Deconstructing Body Of Lies are viewable two different ways. There's a Focus Point branching option, that pops up a symbol onscreen during the viewing of the film that will divert you over to the relevant segment. Or there's the old-fashioned method, where you can pick and choose which ones you want under the extras section. Interactive Debriefing sports a clunky interface�some sort of convoluted matrix chart�and is a small block of interviews with key personnel such as Ridley Scott and Leonardo DiCaprio on different aspects of the production. Not terribly heavy duty or revealing when all is said and done. A set of five deleted scenes and an alternate ending runs just under 15 minutes in total, and features a Scott intro, as well as optional director commentary for the excised footage. 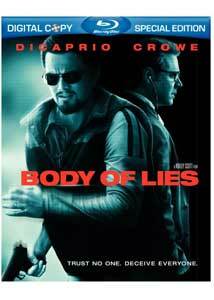 The BD-Live content barely merits a mention, as it features the Body Of Lies trailer. The film is cut into 33 chapters, and features optional subtitles in English, French, Spanish, and Portuguese. It features a pair of generally engaging actors, and it comes from one of my favorite directors, yet Body Of Lies fails to effectively come together as a whole. Yes, there are some terrific sequences�some action-related, some more personal�but the entire experience is somewhat underwhelming.